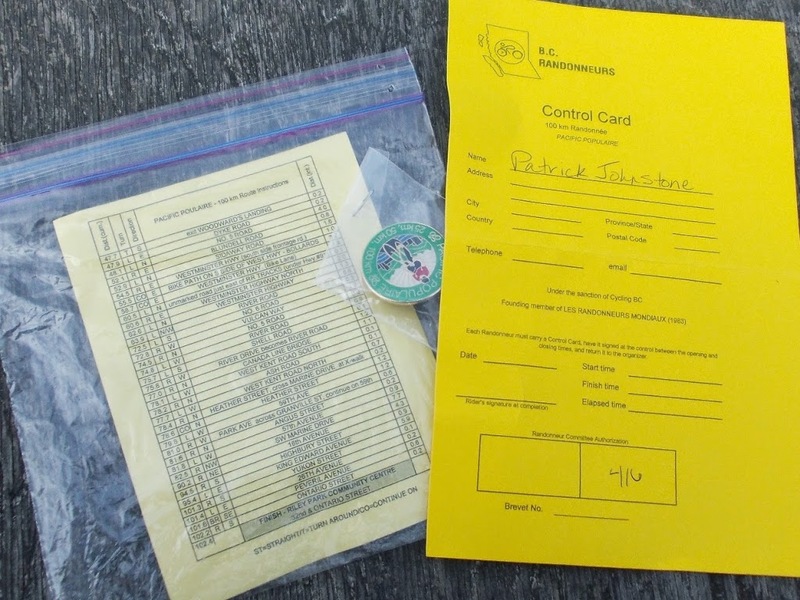 Posted on April 30, 2014 February 6, 2015 . by Patrick Johnstone. Leave a comment. Third in a short series of short ideas about New Westminster’s transportation equation that are not my ideas, but are ideas I love. This letter to the NewsLeader is right on the mark. The Pattullo Bridge is an important part of New Westminster’s Heritage. The Pattullo is the same age as the Lion’s Gate Bridge and the Golden Gate Bridge, and is only a few years younger than the Sydney Harbour Bridge. All three of those structures are made predominantly of steel, and have received significant maintenance and updates to sustain their character and structure. All three also mark the skylines of their respective hometowns. The Pattullo has been no less iconic to New Westminster which is (I shouldn’t need to remind you) one of the most historic cities in Western Canada. What other structure in New Westminster is as historic or as immediately recognizable as the Pattullo Bridge? Some may argue the old Train Station at the foot of 8th Street, but there would (rightfully) be wailing and rending of garments if anyone seriously suggested knocking it down. There was a minor crisis when the restaurant in it closed! 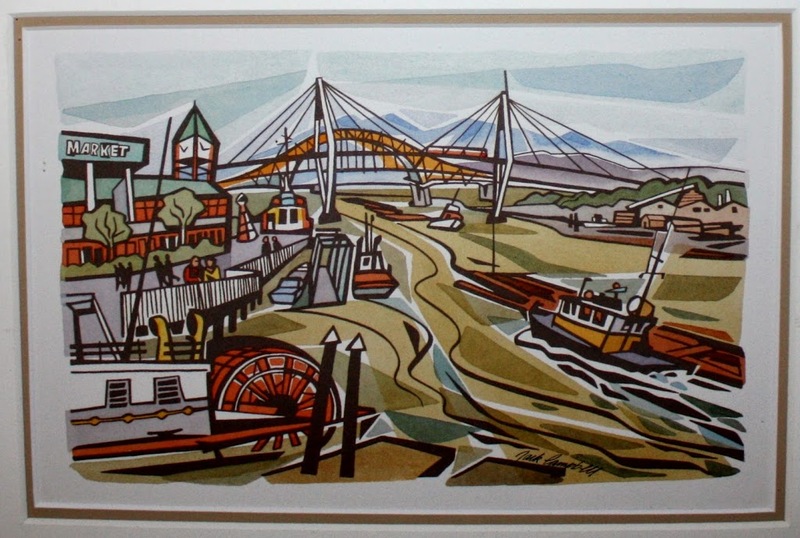 For 75 years, the graceful orange arch of the bridge named after Duff Pattullo has graced almost every “skyline shot” of the Royal City, in photography and in painting. Jack Campbell painted and drew it extensively, as did Joseph Plaskett. In all the rush to replace, repair, re-think the Pattullo and design freeways through our City, why is no-one in this City that otherwise emphasizes its heritage and history, talking about the historic value of the single most iconic structure in the City? Posted on April 28, 2014 February 6, 2015 . by Patrick Johnstone. 2 Comments. The Port Mann Bridge can be its own Toll Free Alternative. The Ministry of Transportation decided several years ago they were going to build a 10-lane tolled bridge to replace the Port Mann. At the time, they promised the irate people in Surrey who were affronted of the idea of paying for infrastructure built for them that there would always be a “Toll Free Alternative”. They could use the big, shiny new bridge and pay $3 to save time, or they could use some alternative, and save money. Turns out that alternative was New Westminster’s surface streets, and we all know what happened. 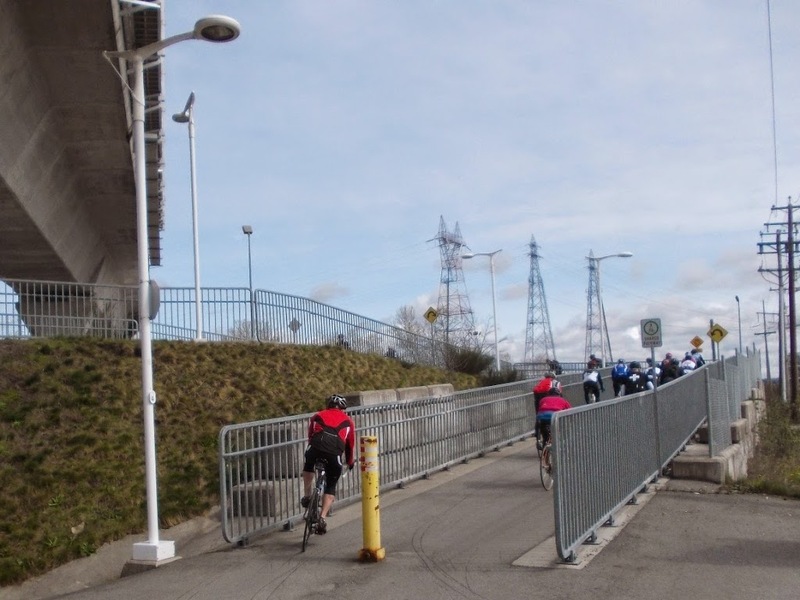 Many are already calling for tolls to be put on the Pattullo to pay for its upkeep or replacement, and to return the traffic to the barely (but slightly more) tolerable pre-Free-Alternative conditions. So tolls on the Pattullo may solve some problems created by the tolling of the Port Mann – but what of the promise of the free alternative? Seeing as how the Port Mann is currently operating tickety-boo with only 8 lanes opened, and two more lanes are scheduled to open some time in 2014 – How about using those two unopened lanes of the Port Mann as the toll free alternative to the tolled 8 lanes? It is devious in its simplicity. When the two new lanes are opened later this year, make them toll-free. There is oodles of underutilized pavement at both ends of the bridge, give the road user the ultimate and easy choice: pay the $3 toll and enjoy one of the 8 free-flowing lanes, or get in the queue with all of the other people who have more time, and wait to squeeze into the free lane. 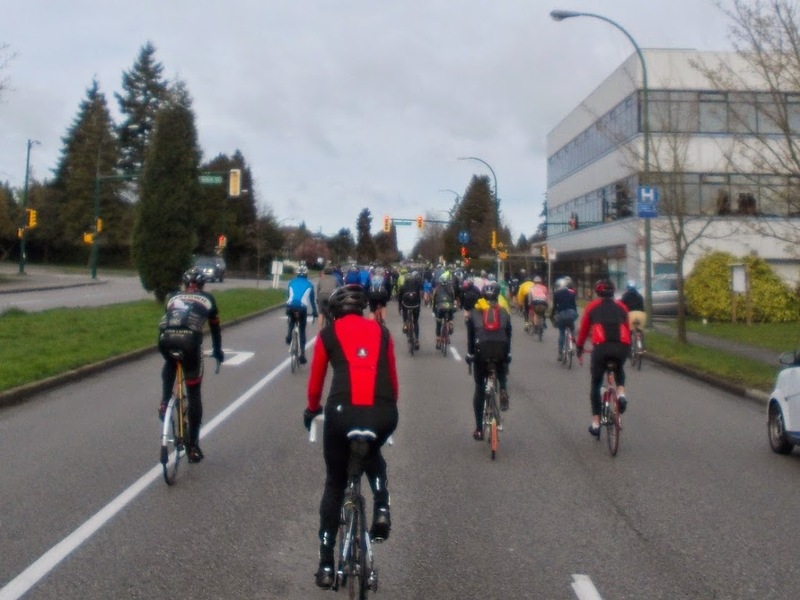 Perhaps the most brilliant point is that drivers will not have to exit the freeway and roll the dice with New Westminster surface streets, they can stay on Highway 1, observe the queue for the free lanes, and make the rational choice for themselves at the time they need to cross the bridge. This will cost nothing to set up, except a few traffic barriers to separate the alternative lane from the general flow of traffic. I suspect the pressure will immediately arrive to open 4 lanes as the toll-free alternative, which would still provide a significant time savings and increase in lanes over what existed before the Port Mann was replaced. And New Westminster would finally see a little peace. Posted on April 27, 2014 February 6, 2015 . by Patrick Johnstone. Leave a comment. The tunnel may be a goods movement solution, but it isn’t a congestion solution. During the most recent Master Transportation Plan open house, the City of New Westminster introduced an idea that has not really been discussed before: an east-west road tunnel under New Westminster, allowing trucks (and cars?) to bypass Royal Ave and Front Street altogether. click to enlarge, and note grey dotty line. Clearly, details are lacking, as it is a very preliminary idea – really little more than a fuzzy dotted line on a map. There is no clear idea how it will connect to existing roads, if it would be a trucks/commercial vehicle only route or open for general use, how many lanes it would be or if it would be tolled. Actually, there is no suggestion who would pay for this very expensive piece of infrastructure. These details have not stopped people form speculating that this may be the “solution” to New Westminster’s traffic woes. However, it isn’t that, and I don’t think it is being purported to be that by the City. Such a tunnel may provide a friendlier way to move thousands of trucks a day through New Westminster (if the region, the Port, the BC Truckers Association, the Ministry of Transportation, or whoever the hell is making the decisions around here insist this is the best way to move goods in the next century) while protecting the livability and safety of our community.So if whomever wants to “free up goods movement” through New Westminster, the City has just provided a line on a map towards that end. However, I’m pretty convinced the people with the actual purse strings would balk at the cost. The most important fact is that it will not do one iota to reduce traffic congestion in our city. It may shift the congestion to the areas around the portals at each end, and worsen it in places like the Queensborough Bridge and Brunette, while toll-avoiders and congestion-skirters will still “rat-run” through our neigbourhoods instead of waiting and paying to go underground. Like major urban tunnel systems from Seattle to Brisbane, it will only induce increased congestion on surrounding roads. Posted on April 26, 2014 February 6, 2015 . by Patrick Johnstone. Leave a comment. I don’t write much in the forum about school board issues, mostly because I don’t have kids in the New Westminster school system, and there is enough politics in this town to spin anyone’s head without including the twisted and acrimonious history of schools governance. However, I am a casual observer, and I pay school taxes like anyone else, so I am not completely disinterested in the process. That said, I am happy to hear that there is a more collaborative approach emerging at School District 40, and that the new leadership in staff is not only effective at solving some long-standing issues, but is willing to stick around for a while to see the job done. With one new school taking shape, another breaking ground, and funding (apparently) secured for the third, there are reasons to be cautiously optimistic about the future of the New Westminster School District. Why cautious? Because the funding issue is still here, and it is not going away. At least in this case, New Westminster is in good company. The Families First government has not quite articulated how we are going to fund the school systems we need to compete in a knowledge economy (at least until we are all rolling in LNG riches). Instead, the Minister is on the road and on the radio telling all of the schools to tighten their belts, because if there is one thing our province cannot afford in these Uncertain Economic Times(tm), it is to prepare our youth for an uncertain future. School District 5, in the East Kootenay, is suffering from the static provincial budget and aging infrastructure they cannot afford to replace. School District 20 in the West Kootenay is trying to figure out how to avoid a budget deficit next year, and is looking at various options to cut staff. School district 23 in Kelowna has no idea how to spread about the various cuts they are going to have to make to get their expenses below their revenue. School District 37 in Delta is finding an increase in enrollment isn’t enough to offset the systemic long-term underfunding. School District 39 in Vancouver can’t decide whether to cut athletics, music programs, or to have another spring break in November to stop the bleeding. School District 41 in Burnaby is metering out the staff cuts, increasing class sizes, and reducing program levels to help manage its ballooning deficit. School District 42 in Maple Ridge is trying to balance the layoffs of teachers and the layoffs of support staff to decide between quality of education and student safety. School District 43 in the Tri-Cities is seeing a massive shortfall, in one of the fastest-growing urban areas in the province, and specifically cites a long list of provincial “downloading” of costs. School district 61 in Victoria, yes even the Province’s Capital doesn’t get away without a serious budget shortfall, is talking about closing schools. School District 62 in Sooke has cut its deficit by laying off workers and creating split-grade classes. School District 68 in Nanaimo is facing a $5.4 Million shortfall, and is counting the upcoming layoffs from teaching staff. School District 69 in Parksville is contemplating which schools to close to deal with their operations deficit. School District 73 In Kamloops, is in relatively good shape, only trying to find room for a $1 Million shortfall. …and this is just the start. Our school systems will not be what we want it to be until it is properly funded, but just preserving and persevering is going to take collaboration and cooperation. If this burgeoning Parent’s Group is what it appears on the face of it (and I was not able to attend their inaugural workshop), we can add them to the many lights that are appearing at the end of the long tunnel.However, I am afraid what we need in our school system is not more voices, but more resources. 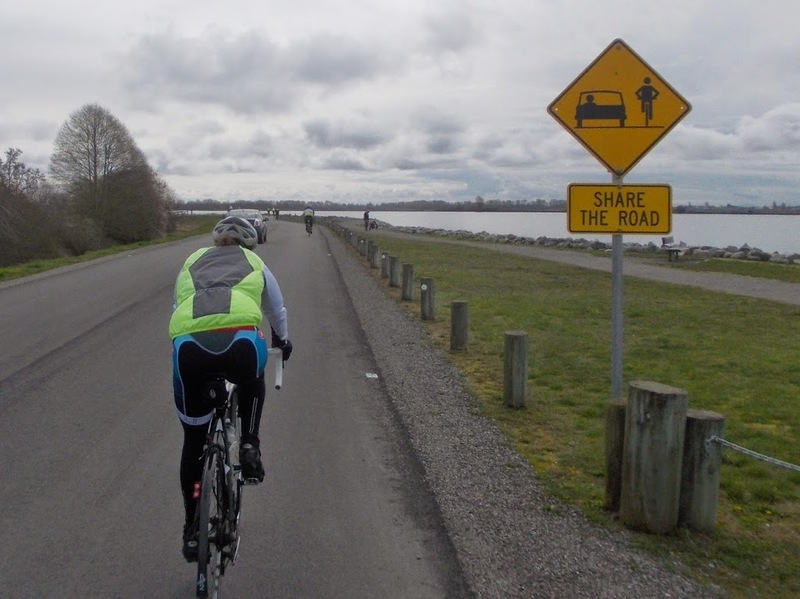 An April bike ride report. Posted on April 21, 2014 February 6, 2015 . by Patrick Johnstone. Leave a comment. I like to ride bikes. I do a lot of different bike riding types. Sometimes I commute to work on a bike. Sometimes I use a bike to get around town. Sometimes I hop on a mountain bike and go up Burnaby Mountain and ride the trails I have known intimately for more than 25 years. I used to race bikes, with a remarkable level of non-very-goodness. Sometimes I get on a road bike with friends and pound a few score kilometres off between coffee breaks. That last one is where the Fraser River Fuggitivi comes in. 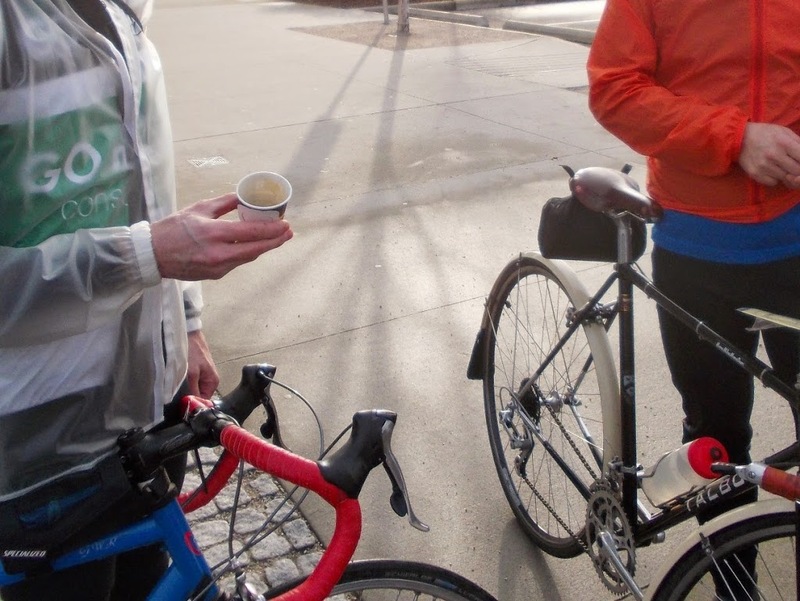 FRF is an informal group of something like a dozen people, some sub-set of which meet up regularly on Sunday Mornings (in months without an “r”) at the River Market in New West and ride to a distant coffee shop. Very social, sometimes fast, always fun. 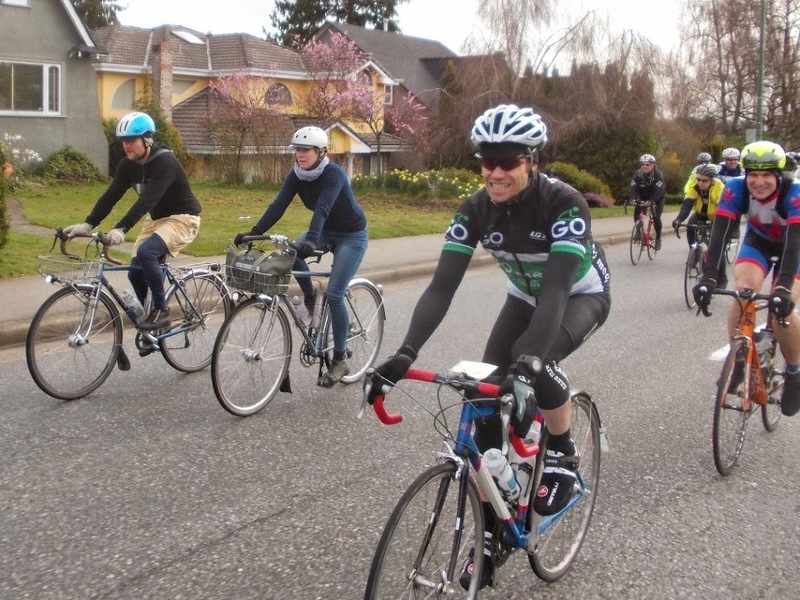 This year, the FRF took a group approach to a spring ride that has been a Vancouver tradition for 29 years: the Pacific Populaire, run by the BC Randonneurs Cycling Club. And that, I suppose, takes some definitions. A Randonneur is a person who likes to ride a bicycle very long distances. It is neither touring (where you travel through the countryside or across the country carrying tents and sleeping bags, and enjoying the sights), nor is it racing (where people compete to get from A to B as fast as possible). Instead, they do rides called “brevets” which are measured distances (typically 200, 400, or 600 km) that must be completed in some minimum time. For example, a 600 km brevet must be completed within 40 hours. 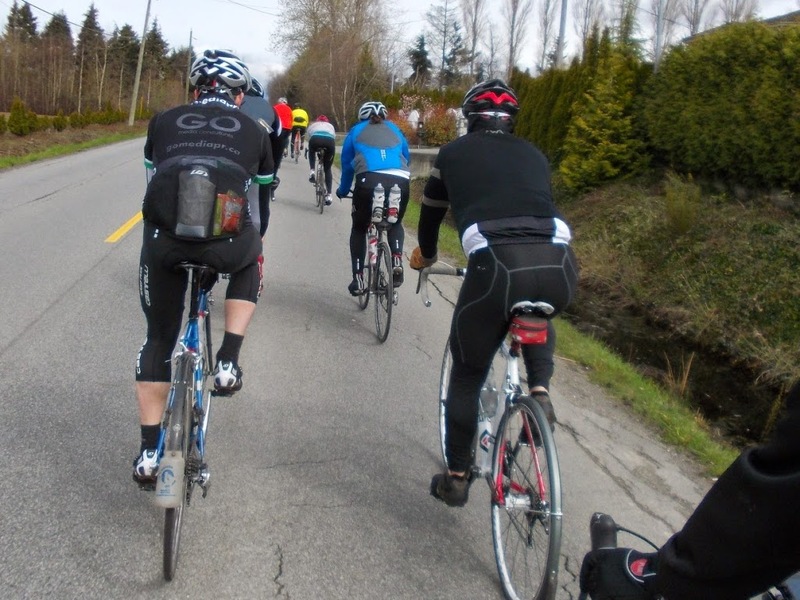 Each rider can decide how much time they spend riding or sleeping in those three days. The mother of all Brevets is the Paris-Brest-Paris, a 1200-kilometre voyage into the depths of your own soul that must be completed in 90 Hours.Madness. A Populaire is an ever-more-rational and somewhat more social event. The Pacific Pop is an annual spring event held the first weekend in April. Although it is structured like a brevet, it is “only” 100 km. The idea is not to make record time, but to shake out the winter cobwebs and have some fun. The roads are (mostly) not closed, but some of the usually-strict Randonneur rules (mandatory fenders and tail lights, etc.) are relaxed. In rainy weather, a rear fender is more a courtesy to your fellow riders than an attempt to keep dry. 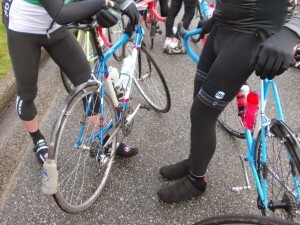 With a showery forecast, many of the FRF went for the Fender Mullet: Business in the back, party in the front. 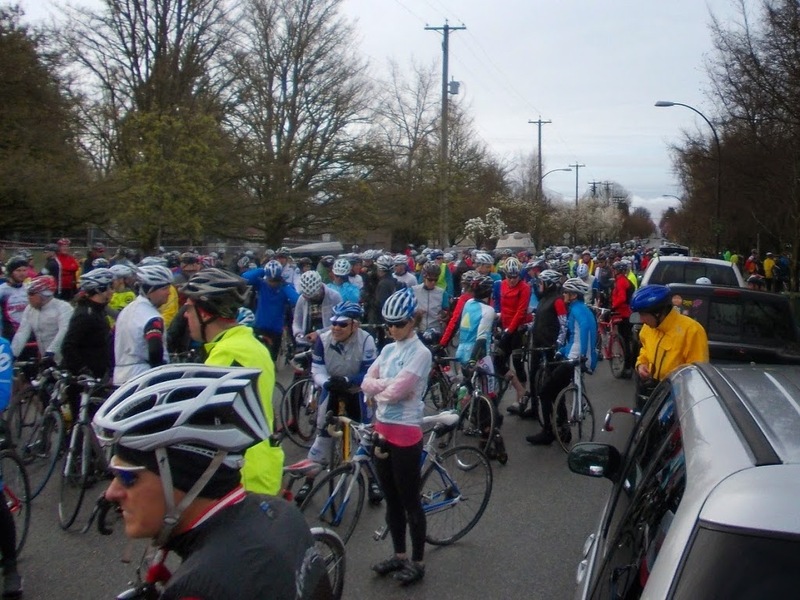 The 2014 Pacific Populaire had 700+ riders, which makes for a crowded start area. Luckily, the first kilometre or two are closed to cars, to give the riders a chance to spread out and make space. 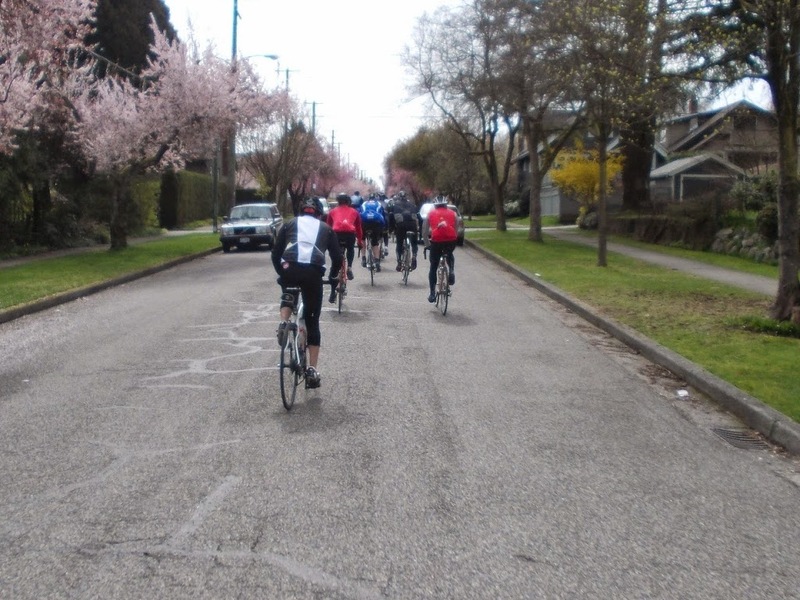 Unlike a race or a Fondo, the traffic lights were operational for the entire ride, and the entire group generally followed the rules of the road (two-abreast riding notwithstanding). I seem to remember saying to Matt about this time: I know you feel good now, but with 80 more km to go, let’s think about saving energy. The control station was on Dyke Road in south Richmond, about 45km in. 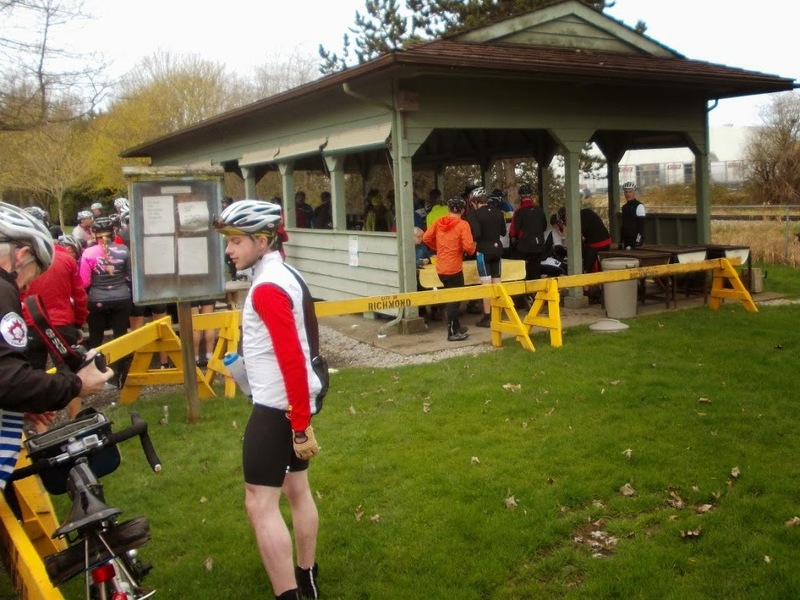 Here riders get a time stamp for their cards and fill up on baked goods, oranges, and Gatorade. 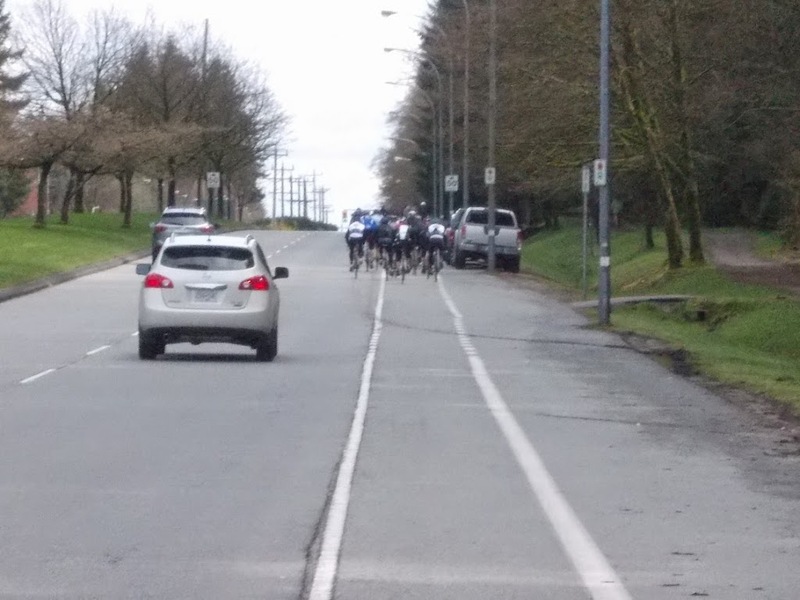 Then back on the rural roads of east Richmond for some serious paceline action to make up for the lost time. River Road in north Richmond is the regular FRF stomping grounds. The rains refused to come, but the headwind here was feeling rather unkind. 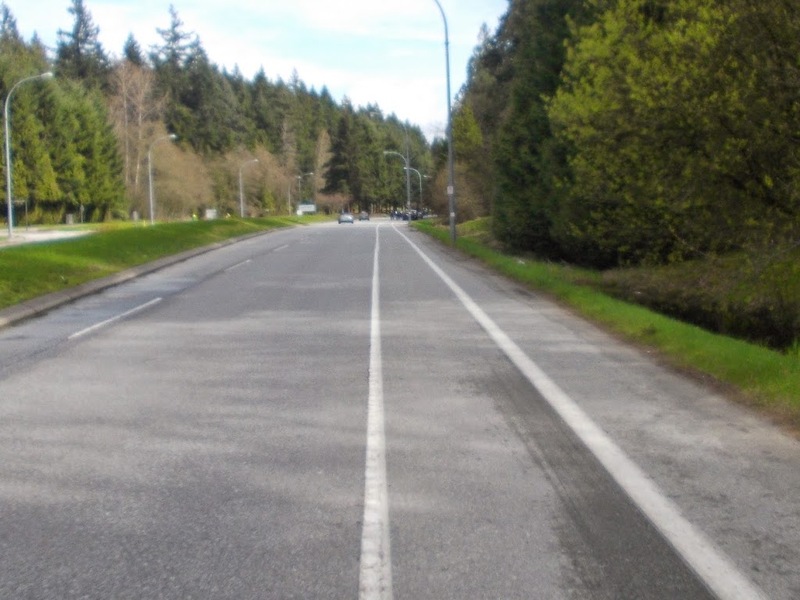 Back over the best piece of bicycle infrastructure in Greater Vancouver. I hope they had the traffic counters on for the bridge today. It took more than 5 minutes, but the gap is closed, and I hook back up with the FRF folks. …and the real reward of 100km in April. MoreMilesMoreBeer. That’s the FR Fuggitivi motto. Posted on April 16, 2014 February 6, 2015 . by Patrick Johnstone. 1 Comment. With a spate of new (but remarkably familiar) signs going up around town, and everyone wondering about how increased consolidation could possibly result in increased competition, I have also been thinking about the changes in the New West retail world, and what they may mean. Admittedly, I may be the wrong person to opine on this. I pretty much hate shopping, and by Brand Loyalty gland seems to have swole up and broke. Allow me to explain. I spent much of my young life working in retail. My parents were small business owners, and I worked around the shop from a young age. Even when not working around the shop, it was the place I hung out at after school in those pre-teen years. Eventually I was cleaning shop, merchandising goods, helping with inventory and sales, waxing skis and fixing bikes. Although I did a variety of other jobs when I was young (pulp mill, bike courier, logistics, dishwashing and kitchen prep, etc. 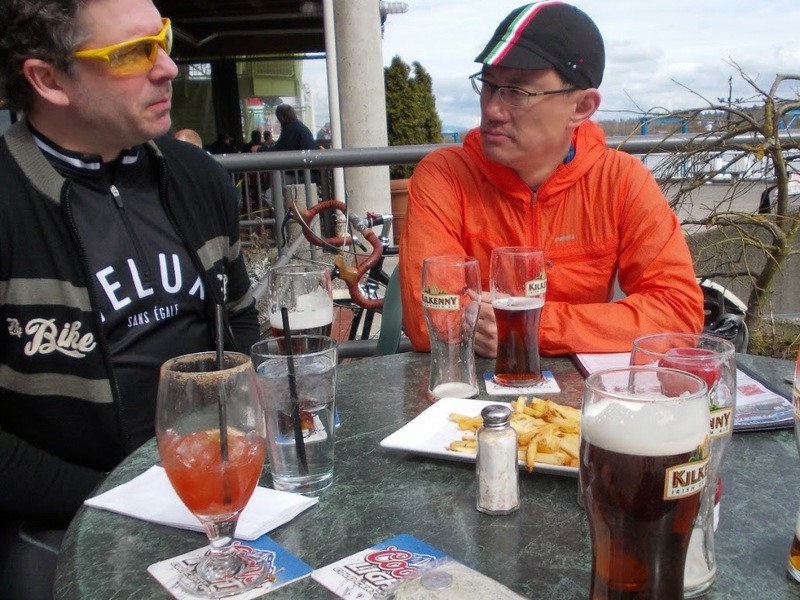 ), pretty much all of my beer money through my undergrad came from working in bike shops – I loved working in bike shops. It may be because of these retail experiences that I am kind of cynical about retail sales, and generally dislike most retail experience decades later. I suspect it is some combination of subconsciously seeking the approval of the retail salesperson (wanting to not be one of those “bad customers” we criticized in the back room) and my internal critique of everything that a retail salesperson is doing to persuade money from me. I’m sure a therapist could work these knots out of my psyche, but as the end result is my buying less and living a more affordable lifestyle, I’m not sure it is top of the list of personality problems I need solved. For likely unrelated reasons, I am not “brand loyal” at all. I essentially don’t care what name is on the outside of a store, but I do care about what is inside the store. I like to shop locally, and help out a small business person if I can. I don’t want to buy my underwear and spark plugs in the same store. I want the person selling me something to know more about it that I do. I will pay more for a higher-quality more durable product, if that option is available to me, but only up to a poorly-defined point of marginal gains. When shopping for apples, I look for the BC label. For larger purchases, I do my research, know what I want, and am rarely swayed from my opinion. I hate when shopping is a hassle, and more often than not, I find shopping to be a chore worth avoiding than a pleasurable way to spend my time. Again: the rich psychological tapestry. With that context out of the way, how does this manifest on grocery stores? I have an internal algorithm that balances proximity (because I would rather walk), large but not too large (enough selection to find what I want, but not to be overwhelmed by variety or scale), a good produce section (because I like to buy ingredients as opposed to prepared foods, and this is where a quality difference makes a big difference) and easy to manage (reducing the hassles). 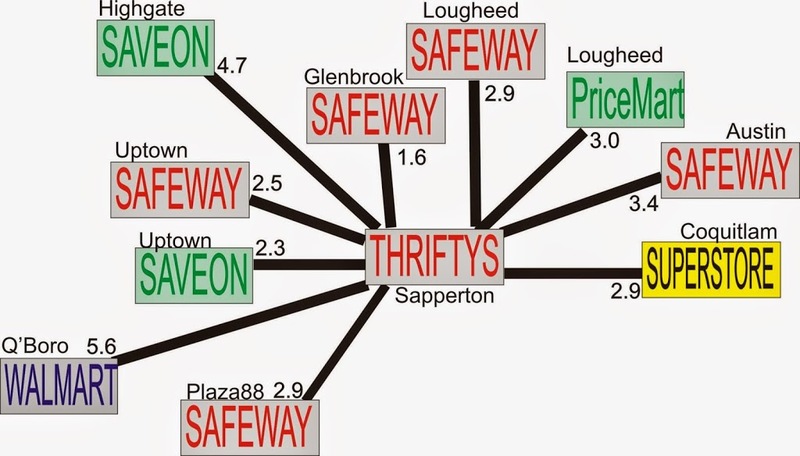 When living near Lougheed Mall during my SFU days, that added up to the Lougheed Safeway. When living in downtown Langley a decade ago, that added up to the old-school Overwaitea/Save-on-Foods a block away. When living in Champaign, Illinois, that added up to a Meijer, which was a humungous big box store on the edge of town, but had an excellent compact grocery within and the only decent produce section in town. At my current Brow of the Hill address, that adds up to the Save-on-Foods in the Westminster Centre. In my experience, the brand of the grocery store doesn’t matter that much – the difference in the shopping experience is a product of the staff and managers. Some stores are, simply, better run than others. They are all selling the same stuff in different packages and most analysis I have read suggest that if some have higher prices on some types of goods, they almost invariably have lower prices on other types. If a store has lots of expensive high-end packaged goods, they can generally afford to sell the staples at lower margins, and vice versa (which in part exacerbates the paradox that staple foods can cost more the lower-income neighbourhoods). I love(d) the Thrifty Foods in Sapperton every time I was in there. In a very short time, it became my favorite grocery store in town, but I rarely shopped there – the proximity part of the algorithm just didn’t work out. When I was near-by, I shopped, but for the most part, the more local shop won. The Safeway in uptown is strangely too big and too hard to navigate, and I cannot get over the impression that things I buy there cost more than at Save-on (I have no data to support this, only personal anecdote). For quick-shop things, I often run to Uptown Market, which is a great little grocery, and in the summer months, try to buy produce from local producers along Marine Drive in Burnaby and, of course, at the Royal City Farmers Market. I am convinced by my own theory that the things that make the stores I prefer better are the staff and managers. 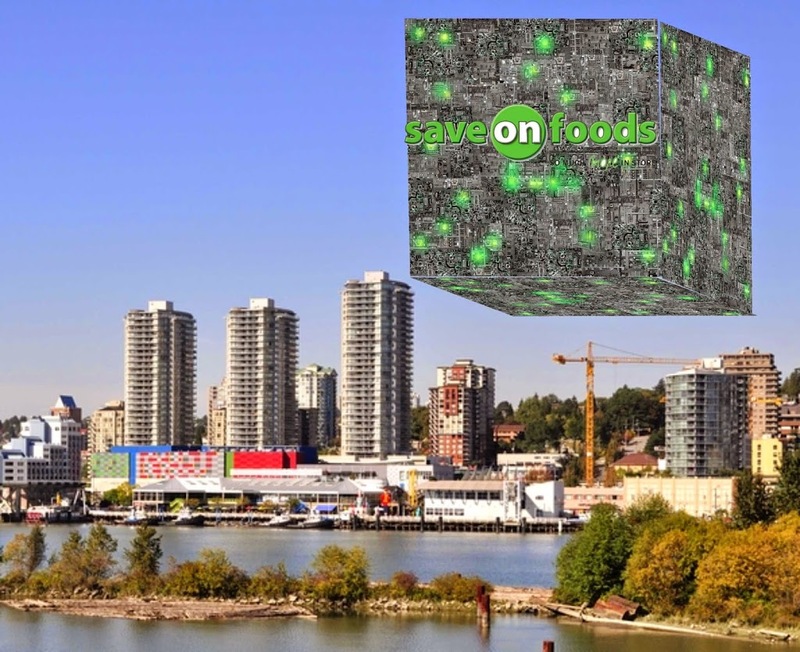 So when I heard that Thrifty Foods in Sapperton is being converted to a Save-on-Foods, I was glad to hear the staff were staying put. In fact, the order from the Competition Bureau insists that they not change staff when they sell the store off. The management and staff of that store have been exemplary to deal with. Not only has the shopping experience there been great, they have taken a really proactive role in community outreach. They contribute to community festivals in fun ways and have contributing to amateur sport in town. The General Manager, Doug Ford (no relation) has gotten involved in local organizations and is a great guy to chat with. He seems to understand community and his store’s role in it. I have no reason to believe that will change when the CEO changes from Marc Poulin to Jimmy Pattison. Only time will tell. As for the Competition Bureau decision, we need to keep in mind that this was part of a country-wide purchase of 213 stores. When you read the Position Statement, you can see how they arrived at the decision they did. The math was based on distance to closest stores, competitors and non-competitors, and community mobility. In a dense urban area like ours, they looked at the make-up of the closest grocery stores. seen form 10,000 feet up, it would be easy to argue that this is a more level and competitive field. One has to recognize this does not reflect exactly how the neighbourhoods work, nor does it include the smaller grocers (specifically exempt from the analysis the Competition Bureau performed, based on their Position Statement) like Donald’s. The analysis also did not anticipate the selling of the old IGA location to Save-On/PriceMart, or the introduction of a WalMart to uptown, but even the Competition Bureau can’t predict the future. Me? I’ll still go up to Save-on-Foods in Uptown, because my personal algorithm hasn’t changed. If it closes (as I suspect it will, even Uptown can’t manage kitty-corner Save-on-Foods), the math will shift with it, and maybe the other Uptown Save-on will be the winner. Posted on April 13, 2014 February 6, 2015 . by Patrick Johnstone. 4 Comments. 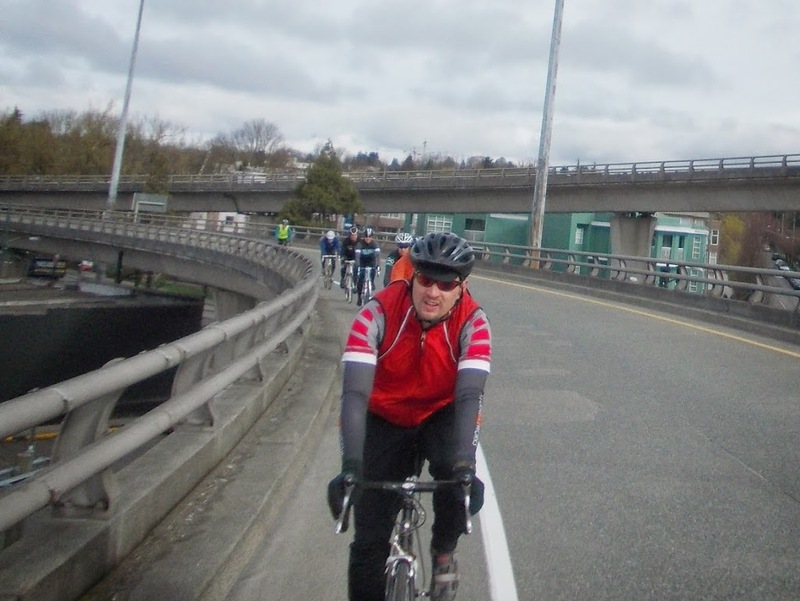 I have already written a piece about the City of New Westminster’s Reasonable Approach position paper on the Pattullo Bridge, and have done a bit of my own road show: going to various places around town asking people to send letters of support to the City. I have actually been pleasantly surprised by the reaction from residents across the City, as they seem overwhelmingly in support of limiting or reducing the traffic impact on New Westminster from any replacement or refurbishment of the Pattullo. The idea of tolling the Pattullo (or at least that of level regional tolling) seems to have the strongest support, as the data relating to increased traffic induced by the Port Mann tolls is clear to even the most pro-driving-in-traffic people (because even the most pro-driving-in-traffic people seem to be against other people driving in their neighbourhoods mucking up the traffic…. but I digress) . However, some people are wondering why our city Councillors are travelling to other Cities to make the case. 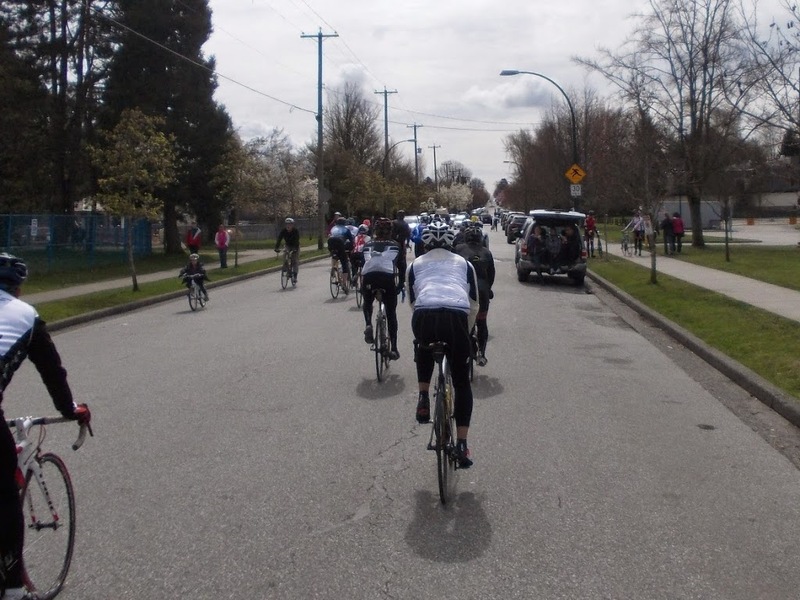 I will argue that the unfortunate quote of Councillor Puchmayr in the Record – “It’s a move of desperation” – both mischaracterizes what is happening, and makes the case for the real reason the City is expending this much energy. Even perennially-daft Rick Cluff understands, with the City’s Master Transportation Plan nearing completion, the Pattullo Bridge is the #1 transportation issue in New Westminster right now. It is important that we get it right. The fate of the Pattullo Bridge will not be decided by New Westminster, it will be decided by TransLink in consultation with New Westminster, Surrey, and other stakeholders. It is very likely (although this is only speculation at this time) that the Pattullo Bridge replacement/refurbishment will be part of the package of projects that will be included in whatever major projects master plan the Mayors Council puts together for the TransLink Referendum. 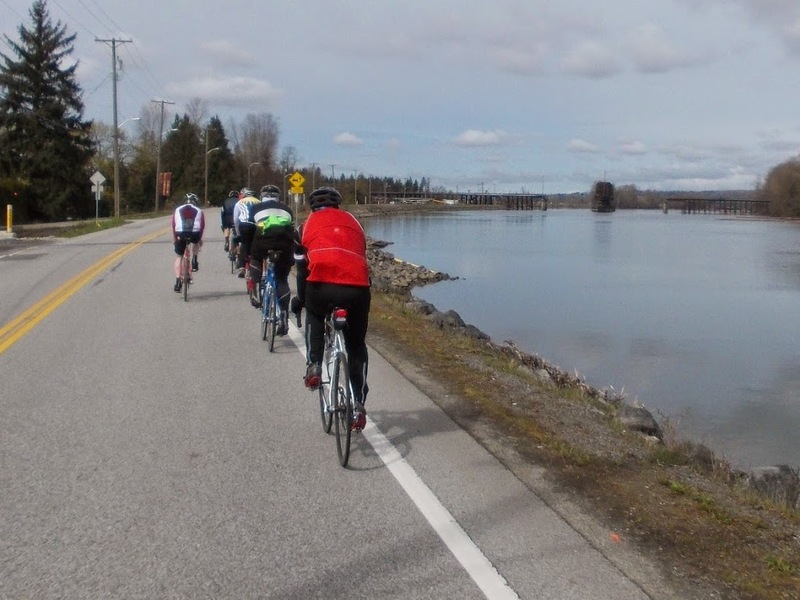 With New Westminster being a small fish in that relatively large pond, it is critically important that our small voice be heard, and our rationale explained clearly, to the entire stakeholder group in the regional transportation mix. This is not the desperate act of a Council that does not have facts on its side. The Reasonable Approach document outlines how expanded capacity at the Pattullo does not address the problem set identified by TransLink, does not meet the objectives set out by TransLink for addressing the Pattullo Bridge, and is in opposition to every transportation and land use plan approved by New Westminster, Surrey, TransLink and Metro Vancouver over the last 20 years. It also details, with supporting data, the negative impact that making the Pattullo the “toll free alternative” has had on the livability of New Westminster and Surrey. It is a well-argued case, based on regional priorities and objectives. The problem is, that paragraph I just wrote will never make it into Rick Cluff’s brain. It will never make it into the Metro Newspaper, or into the editorial pages of the Vancouver Province or the GlobalBC Newz. If the City of New Westminster wants the decision makers across the region to understand what the position paper actually says, they will not be able to rely on the media to deliver that information. They need to get the correct information into the hands of those Councils and Mayors who will be advising on the regional transportation plans. The media isn’t going to do that for them, not accurately, at least. It may not be obvious to most people, but all of the Councils of the various Cities rarely get together to talk about each others’ issues. Yes, there are regional boards, organizations like the UBCM and FCM, and occasional issue-driven direct meetings, but in their day-to-day world, the 20-odd local government Councils that make up Metro Vancouver do not converse with each other, if only due to practicality of making it happen. City Councillors in Langley City have enough on their plate every week just managing the issues of their community, they cannot hope to be up-to-date on every issue in West Vancouver or Port Moody. The most likely way a Councillor in one City is made aware of issues in other Cities is through the media, or direct written correspondence sent between Councils (this correspondence, more likely than not, written by staff and responded to by staff). New Westminster Councillors going to meet with other Councils directly in their own chambers during a public Council Meeting is unusual, but not unprecedented. More importantly, it allows New Westminster Council to communicate directly with the decision-makers in the adjacent communities without the filter of the media or staff changing (intentionally or not) the message that is being sent. As a bonus, these communications are as transparent and open as possible. There is not better example of the perils of relying on the Media to relate the core message than this story of Burnaby Council’s reaction to the New Westminster meeting. The headline “Burnaby reluctant to support New West’s bridge proposal” would make any reasonable reader assume that Burnaby supports the opposing view (promoted mostly by the City of Surrey) that the Pattullo should be 6 lanes and untolled. However, the real story is that Burnaby felt New Westminster was being too reasonable in their approach, and should take a more extreme position of getting rid of the bridge altogether. With this type of misunderstanding so easy to make, even between City Councils, I think it is a great idea for New Westminster Council to engage their regional partners directly. I imagine they recognize they are in for a bit of a debate at some of their stops, but that is the purpose of consultation. Far from “Going it alone”, the City of New Westminster has taken the problem set agreed to by all parties, used TransLink’s own data, compared the various scenarios to the Regional Growth Strategy, the Regional Transportation Strategy, and the Master Transportation Plans and Official Community Plans of our neighbouring communities, and arrived at a reasonable approach that protects the livability of our community, saves the regional taxpayer money, and provides some of the public transit funding that Surrey so desperately needs, then personally delivered this analysis to all of the regional partners to discuss it and hope to seek a common understanding. You can call it an act of desperation if you want, but I see it as an act of rational, pragmatic, and collaborative local governance. Posted on April 7, 2014 February 6, 2015 . by Patrick Johnstone. Leave a comment. I’m an Environmental Geoscientist. That means I went to school and studied geosciences (in my case, a degree in Physical Geography and one in Earth Sciences), and practice in the area of environmental geology. 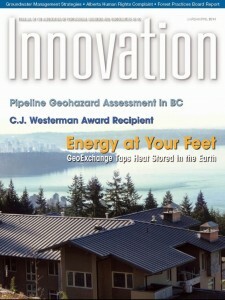 To call myself a “Geoscientist” in B.C., I need to belong to a professional association, the same one as those who want to go around calling themselves “Engineers”. That organization is APEG-BC. For the most part, I am happy to belong and receive both the scrutiny and the protection of a professional body regulated by a Provincial Law. However, Engineers and Geoscientists are a diverse group of people. People designing your smart phone (or apps for it), people designing airplane wings and others making sure they don’t fall off, people building roads and others inspecting dams, people exploring for new oil and gas reserves in the province and people working to make a pulp mill work more efficiently or a power grid more robust. A few of them are scientists in the traditional sense of exploring and testing new ideas to expand the world’s body of knowledge, but most are applied scientists doing their best to apply the existing body of knowledge to solve immediate problems. The difference can be subtle to the lay public, but think about the difference between a medical researcher dedicating their life to finding a cure for disease, and a doctor who spends her career helping people feel better. Nowhere is the difference between research science and applied science as practiced by most engineers and geoscientists better demonstrated than on the topic of Anthropogenic Climate Change. Simply put: the vast majority of scientists working in the relevant fields of climatology, atmospheric sciences, ecology, ocean sciences, Quaternary geoscience, etc. are convinced by the body of evidence that the climate is changing at a rate unprecedented in human history, and that the change is caused by people putting greenhouse gasses into the atmosphere at a faster rate than natural systems can remove them. It appears, from both the academic and popular press, that those that apply science for a living are less convinced. I have no statistical evidence to support this claim, only my totally anecdotal impressions from following the “controversy” in the media (as any good scientist can tell you, the plural of “anecdote” is not “evidence”). I suspect that the majority of engineers and geoscientists are convinced of the reality of anthropogenic climate change, but whenever a group of climate change “skeptics” pops up, the crowd seems to comprise an unrepresentative number of engineers and geoscientists. The problem became more apparent recently when my professional organization approached the subject of Climate Change. After what I have been told was a lengthy internal discussion, APEG-BC released a policy paper on Climate Change this spring (which you can read by following that link). I have a problem with the result. The Position Paper is 1,000 words long, but is more notable in the many words that do not appear: carbon; greenhouse; gas; warming; anthropogenic. It is the softest, most equivocal position paper on the topic I have ever read. It is actually hard to figure out what the “Position” is. Lucky, our organization has multiple internal communications systems, and the letters to our professional magazine “Innovation” is one of them. As a professional geoscientist, I was pleased to see APEGBC issue a policy paper on climate change. However, I was disappointed reading the actual document. In stating that “APEGBC recognizes that the climate in British Columbia is changing”, the document appears so equivocal as to be meaningless. That our local climate is “changing” is not up for debate. The more important issue is that the current global rate of atmospheric and ocean warming caused by anthropogenic activity is unprecedented in human history, and in the history of engineering and geoscience practice. As a profession, we must acknowledge that the unpredictable (and potentially catastrophic) results of this warming are a problem that challenges our ability to protect human health, built infrastructure and the planetary ecosystems that support us. Re-evaluating our assumptions about local weather effects in light of changing climate is useful, but not nearly as important as recognizing that some activities performed by engineering and geoscience professionals may exacerbate the problem. As our Code of Ethics requires that we “Hold paramount the safety, health and welfare of the public, [and] protection of the environment,” we must go beyond merely evaluating impacts, and we must make the move towards reducing then eliminating the root cause of anthropogenic global warming, through technological innovation and best practices, as part of our regular everyday professional practice. APEGBC is a public body charged with protecting the public interest. It is our responsibility to recognize risks that may result from our practice, and be clear about the management of those risks. Forthright disclosure based on the best scientific knowledge is the basis of the trust placed upon us by our clients, the general public and our governing legislation. To be equivocal about the cause and potential impacts of anthropogenic global warming is to belie this trust. I was heartened when the letter published next to two other letters from Professional Engineers in BC saying pretty much the same thing. The letter that followed mine only surprised me in the tepidness of the retort.I think APEG-BC will get it right, this was just a false start. Posted on April 4, 2014 February 6, 2015 . by Patrick Johnstone. 1 Comment. The news came down a couple of days late, as tends to happen when Gulf Islands are involved. Last weekend when we had heard that our neighbor had died, it had already been a couple of days. 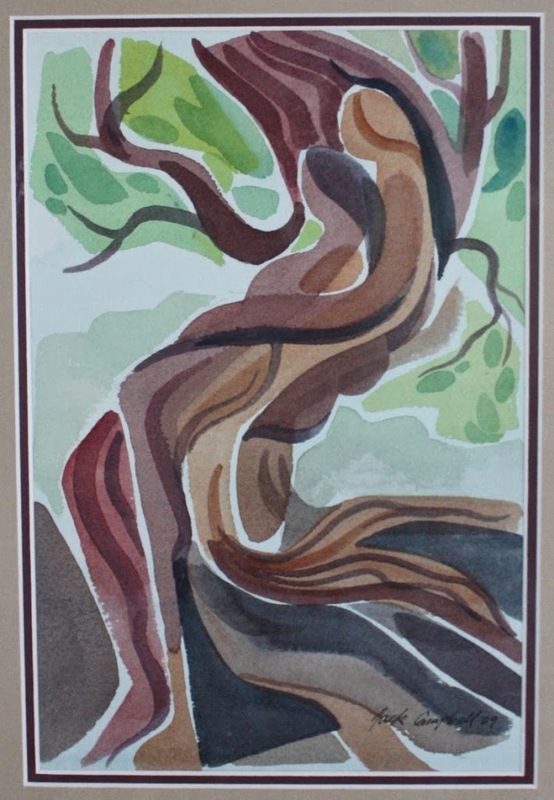 All images are photos of Jack Campbell originals and prints from our home. I met Jack Campbell a little more than a decade ago. He was a resident of Saturna Island, where my in-laws also reside. It is a small community, and it doesn’t take too many weekends to get to know most everyone. Jack stood out at first because of the bright sign at the top of the Missing Link directing people to his gallery. It was a vibrant watercolour of a forested stream, grey rocks and blue water and green trees cross-cut with sharp blades of light. 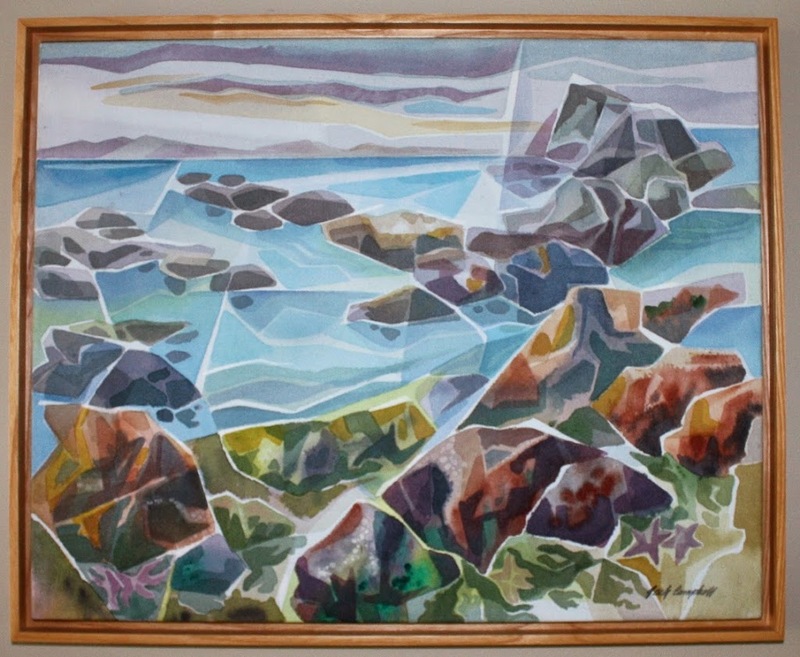 “Pieces of Light” was a phrase he used to describe the style he employed commonly while painting natural areas of Saturna Island and the built environment of New Westminster. It was just a coincidence that the three places Jack spent most of his life, New Westminster, the West Kootenay, and Saturna Island, are three places I called home at different stages of my life, and another coincidence when we bought a lot on Saturna, Jack was our neighbour. The boldness of his watercolours appealed to me immediately, starting with the Gallery sign. 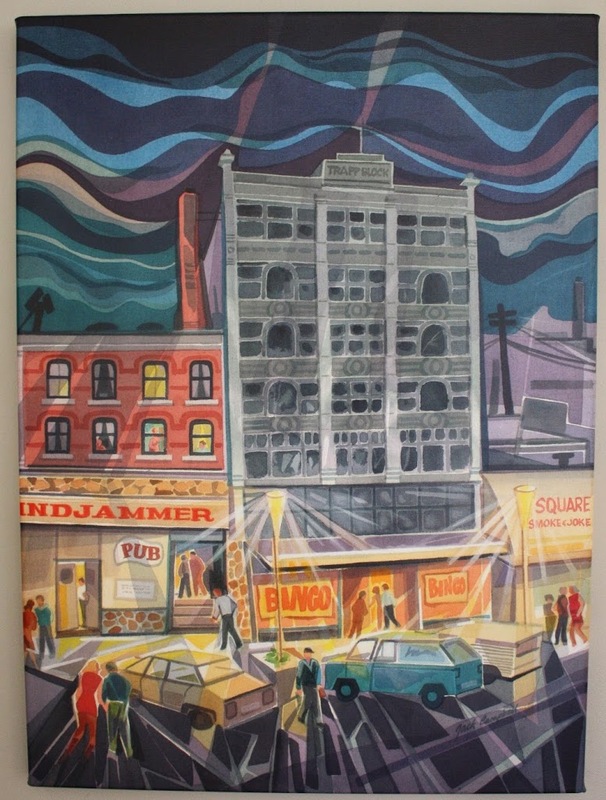 I always preferred his New Westminster scenes, mostly pained back when he had a gallery on Columbia Ave during the Bingo-Parlour-and-After-Hours-Club era of Downtown New West, and the River was more of a working place of log booms and beehive burners and fishing vessels.There is one great original piece in his galley (“that one is not for sale” he would say in his gentle, gentlemanly way) that was a drawing of the Queensborough Bridge being built, with the mills of Queensborough smoking behind, and his green Volkswagen in the foreground. It belongs in a museum. 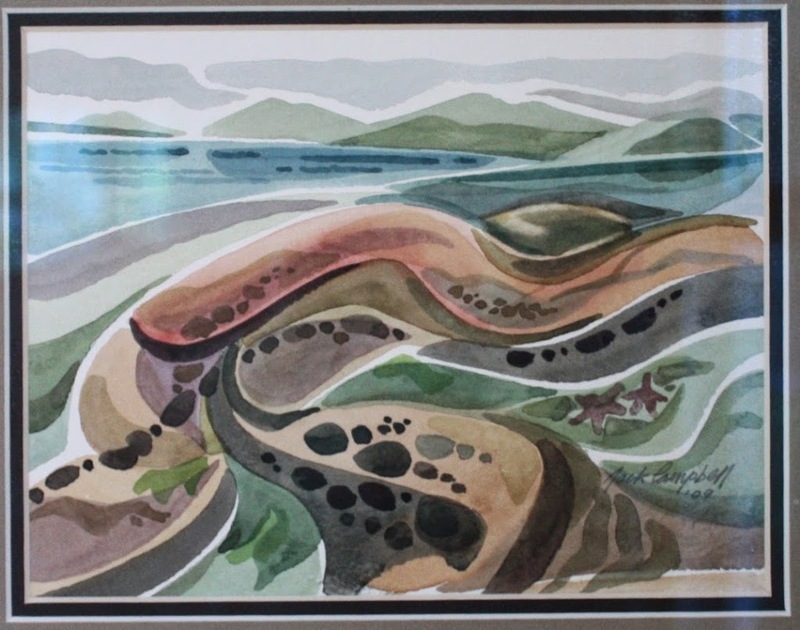 MsNWimby preferred his later work, where he found organic forms in the shorelines and arbutus trees of the Gulf Islands. We always tried to support his small gallery, although most of the time our finances didn’t really allow us to support him the way we wished to! Jack was raised in New Westminster, and had strong connections in this community. 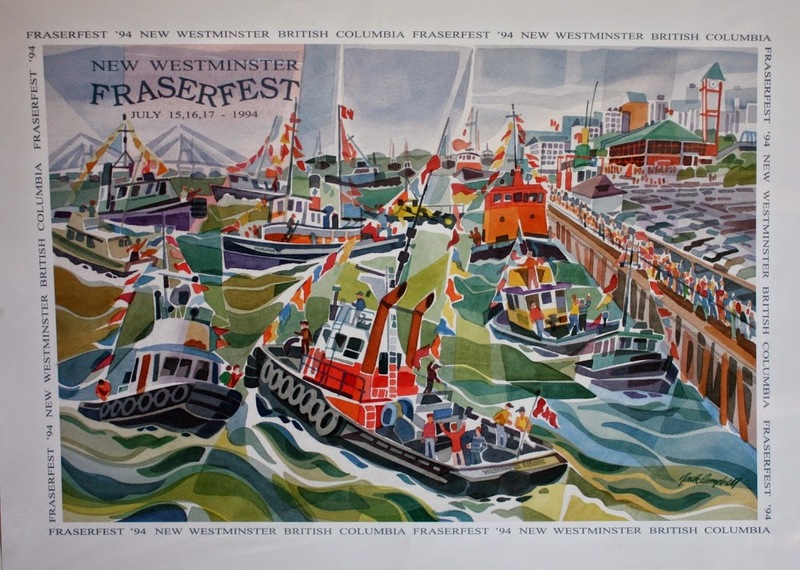 He painted posters for the old Fraser Fest events, and there are various places around town where his paintings still pop up (including one of my favourite works of his in a dentist office up at Royal City Centre). He was a generous man with his talent, often painting posters and postcards for free to be used for events like Fraser Fest or to be auctioned for good causes, and teaching a generation of artists though 14 years of teaching at Emily Carr and 8 more at the Kootenay School of the Arts in Nelson. When he “retired” to Saturna 15+ years ago, he created a new legacy on the island. 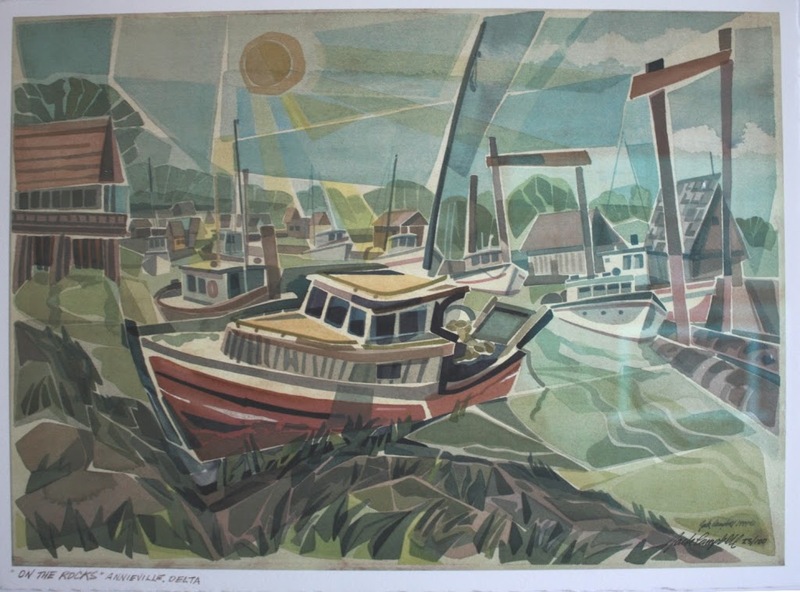 His work is well represented in a wall mural in the old community centre, and even as the artwork on the back of your library card at the Saturna Island Library. Although is work is in collections around the world, it never made him rich; People tell stories of him sometimes paying rent in the form of paintings. However, he created a lot of beauty in this world, and made a lot of our lives richer for having done so. I’ll miss running into him out walking around our pond with Carole and Warbie (their rambunctious little pup named after Warburton Pike), and his welcoming hello whenever we dropped by his gallery. I feel very lucky to have met him, and to have shared a planet with him, if just for a little while.